This black vinyl office chair is beautifully upholstered in soft and durable Caressoft® vinyl. 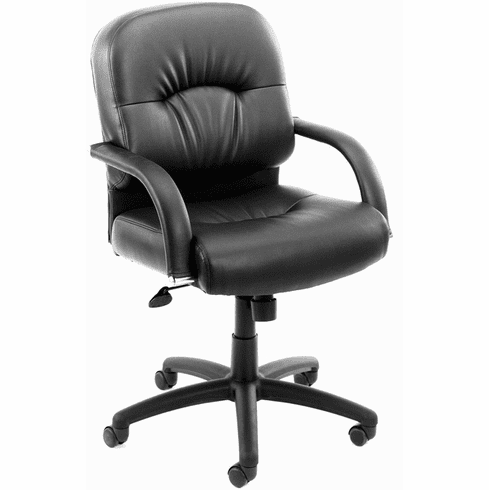 Features built in lumbar support, executive mid-back styling, pillow back design which relieves lower back stress, tilt with tilt tension control, pneumatic seat height adjustment, and a 27" nylon base with dual wheel casters. You can upgrade to a chrome base for a minimal charge. Dimensions: Seat size: 21"W x 21"D. Back size: 21"W x 21"H. Warranted by Boss Office Products. These vinyl office chairs normally ship within 2 business days from our GA or CA warehouse.